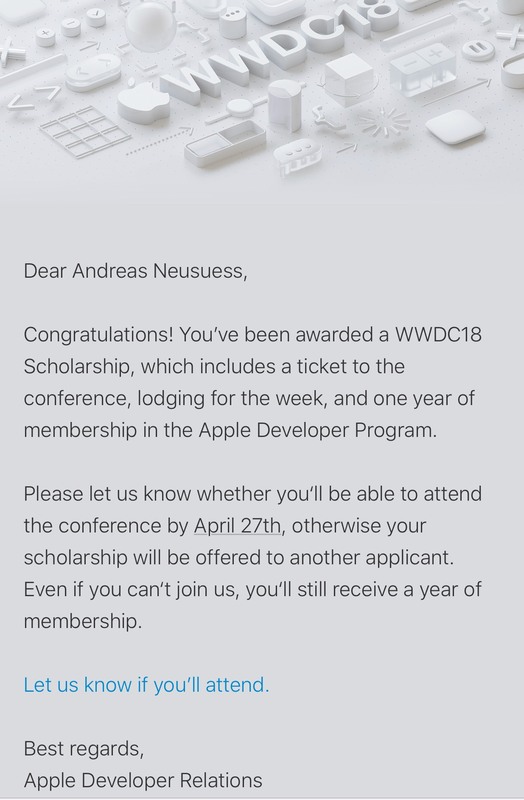 I got a scholarship and therefore I will go to WWDC 🎉! It took my breath away and I needed a few moment to realize it. I will be one of approximately 300 students. After my first astonishment calmed, I thought about all the things that I have to manage as soon as possible. For example, I never possessed a passport – I had no need for it. Now it is one of the most urgent things on my list, as the fabrication needs about four weeks. I did a little research and made a phone call. As it turned out, there is a thing called ‚express passport order‘, which costs more than the regular one but will get me the urgently needed passport in about four days. This weekend, I will place that order. When my passport arrives, I can start to go for a ESTA-visa. In the meantime, I booked my flight to San Jose. It will departure from Frankfurt am Main and will bring me right to San Jose without any intermediate landing, which is great. Lodging will be provided by Apple so fortunately I do not need to care about it, yet. Oh, I am so exited about this opportunity! 26.04.2018 "WWDC18: Update to my Submission".